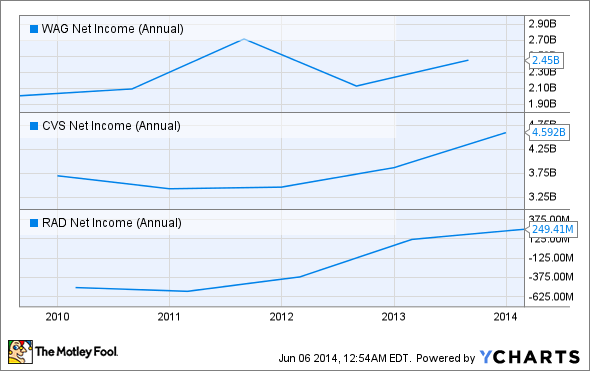 After Stepping Back From a 10-Year High is Rite Aid a Buy? After Rite Aid was slammed on its monthly and preliminary quarterly results, should the Foolish investor jump into the stock? Or would a stake in CVS Caremark or Walgreen be more sensible? After Rite Aid (NYSE:RAD) reported sales for the month of May and preliminary earnings for the first quarter of its 2015 fiscal year on June 5, shares plummeted more than 7% to close at $7.87. Even after taking such a tumble, the drugstore chain's shares are currently trading at a 200% premium from their 52-week low, which might entice some investors to exchange it for a stake in Walgreen (NASDAQ:WBA) or CVS Caremark (NYSE:CVS). In light of the downsides facing investors though, is it possible that now might be the best time to jump into the company's stock? For the month, Rite Aid reported a 3.2% rise in sales from $2.42 billion to $2.48 billion. According to the company's press release, this revenue increase stemmed from a 3.5% jump in comparable-store sales but was partially offset by a 1% reduction in store count from 4,614 locations last May to 4,581 locations this year. On a comparable-store sales basis, the biggest contributor to Rite Aid's performance was its jump in pharmacy comparable-store sales of 5%. This came in spite of downward pressure from the introduction of generic drugs. Front-end comparable- store sales also did OK with a 0.5% improvement, but performance wasn't anything special. Although Rite Aid does not plan to announce formal quarterly results until June 19, the company has provided its shareholders with its preliminary findings. For the quarter, the drugstore chain expects to report revenue of $6.43 billion, up nearly 3% from the $6.26 billion reported in last year's quarter and in line with analyst estimates. Looking at earnings though, the business will report around $0.04 per share. This will represent a significant drop from the $0.09 management reported for the same quarter last year and is half of what analysts have been forecasting. Is there a better alternative than Rite Aid? Over the past five years, Rite Aid has been something of a mixed bag. Between 2009 and 2013, the retailer reported a 0.6% decline in revenue from $25.7 billion to $25.5 billion; a 4% drop in store count was partially offset by a 0.8% improvement in aggregate comparable-store sales. Based on these results alone, most investors might think the company has been anything but good. But when you analyze its profitability, the business suddenly becomes very interesting. During this five-year period, Rite Aid saw its net loss of $506.7 million morph into a net gain of $249.4 million. Despite seeing falling sales, management initiated a series of cost-cutting initiatives that included closing stores and focusing on margin improvement over growth. Through this plan, the retailer was able to gradually reduce its annual losses and -- in its two most recent fiscal years -- has earned a profit. Over the same time frame, rivals like Walgreen and CVS have continued to do well. Between 2009 and 2013, Walgreen saw its revenue climb 14% from $63.3 billion to $72.2 billion; management increased its store count by 14.5% from 7,496 locations to 8,582, and the business' aggregate comparable-store sales inched up 2%. 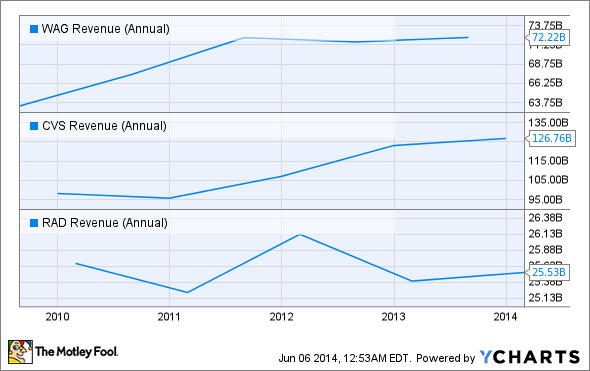 From a profitability perspective, Walgreen's results have been even better. Between 2009 and 2013, the company saw its net income soar 22% from $2 billion to $2.45 billion. This can be attributed to its increase in revenue but also must be chalked up to payments the business is receiving from its 45% stake in Alliance Boots, a European company that investors expect the business to eventually absorb. CVS has done even better during this period. Revenue at the country's largest drugstore chain leapt 29% from $98.2 billion in 2009 to $126.8 billion by the end of its 2013 fiscal year. Just as in the case of Walgreen, CVS reported an increase in store count (8% from 7,095 locations to 7,660), but the main driver behind its results has been its 18% aggregate improvement in comparable-store sales. Looking at profits, CVS has done well too, but the company's bottom-line results haven't been able to keep pace with its hopping sales. Between 2009 and 2013, the business reported a 24% increase in net income from $3.7 billion to $4.6 billion. For the most part, this jump in profits was driven by the drugstore chain's rising sales but was offset by its cost of goods sold, which rose from 79.3% of sales to 81.2%. Based on the data provided, it's clear that Mr. Market isn't terribly enthusiastic about Rite Aid's results and its anticipated earnings for the quarter. While this may come as a surprise to some shareholders, the fact of the matter is that the business has had some difficulty over the past few years, so a hiccup here and there is to be expected. However, the fact that management was able to grow profits at a time when sales were falling, only to see revenue start to increase again, does point to a business that has some potential moving forward. While investing in Rite Aid will likely come with more risk and lower sales growth than what's taking a stake in CVS or Walgreen, investors looking for a business with the potential for improving margins would be hard pressed to find a better prospect than Rite Aid.